STAR WARS: Episode IV, 1977. Authentic US 1 Sheet (27 x 41) advance teaser Style B movie theater poster for sale starring: Mark Hamill, Harrison Ford, Carrie Fisher, Alec Guinness, Peter Cushing, and director / writer George Lucas. 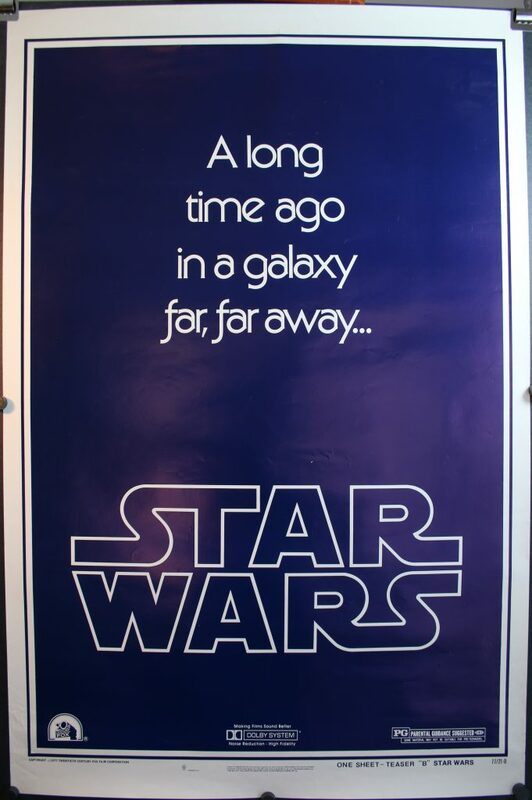 “A long time ago in a galaxy far, far away…” A tag line that is perhaps one of the most resounding sentences from this iconic film series. This authentic advance release style B poster features this epic tag line and is one of the rarer poster styles for the first film brought to movie theaters in 1977. This poster was designed by Doyle Dane and Burnbach who were actually responsible for hyping up the release of this film and came up with many rare poster concepts (Reference). This style B teaser is faked and care should be taken when buying this poster. The fake has fuzzy to smeared lettering and is not as sharp as it should be. The fake is missing a small GAU union label which is oval shaped located in the center of the bottom margin. This particular Star Wars Advance Teaser style B that is for sale is in spectacular near mint condition. It shows only the most minor wear, which is focused along the fold lines and cross folds. There are no other defects to speak.